Whether or not Shakespeare intended for his plays and sonnets to be studied in quite as much depth as they are in schools across the country, there’s no doubting that the themes within them are as compelling today as they were back then. So why not jump on the bandwagon and embrace all things Shakespeare with this mammoth collection of resources? Visually highlight the important personal events in Shakespeare’s life using this well-designed infographic. Or, put them in the context of wider historical happenings with these comprehensive timeline cards. When discussing Shakespeare’s major plays, make sure you’ve got these circular posters displayed around your classroom for easy reference. Alternatively, these eye-catching newspaper covers are an incredibly engaging way of introducing key characters or plot points. Encourage students to feel comfortable around Shakespeare’s language using these illustrated quotes posters, or by framing them as a tweet like the quotations included in this social media-themed pack. This is a visual display that illustrates the key events in Shakespeare's life. (In as far as we know them!) The display also highlights the time period in which his works were written. 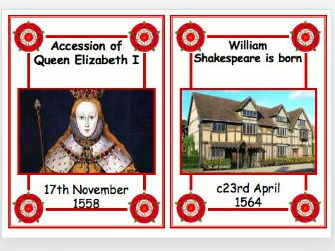 A printable set of cards depicting important events from the life of William Shakespeare. Circle posters containing bold images from modern productions of various plays with an appropriate page of the first folio as a background. Collection of images - Sun front cover for ten of Shakespeare's plays. Couldn't find anything similar out there so I created 12 posters from various Shakespeare plays - there is a key quotation on each. Hope you find it useful! A display that I change weekly with Shakespeare's 'Tweet of the Week'. There are 14 slides so there are enough slides to last a full term. I have also attached a 'Trending This Week' display I change on a weekly basis to go alongside on a Twitter display board. Help pupils get to know more about Shakespeare’s life with this short unit, which also includes an introduction to some of his most popular plays. If you’re looking for a one-off lesson to delve into the world of the Bard, why not try this engaging quiz, with rounds on his life, character, writing and the Globe? Alternatively, this active lesson, which will need adapting for secondary classes, sees students hunting for facts about the Bard’s life around the school site, while this classroom-based version includes some more unusual titbits. 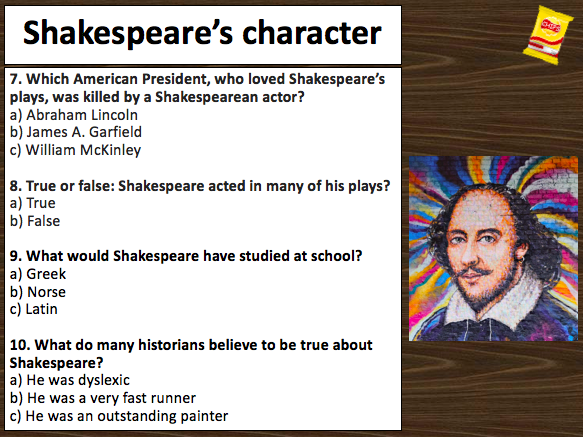 Develop older students’ contextual understanding of Shakespeare’s works by watching the videos included in this concise presentation. Meanwhile, this lesson is great for delving into Shakespearean language and creative insults. The first resources for a Scheme of Work introducing KS3 students to the life, context and works of William Shakespeare. Resources include worksheets and powerpoint presentations. The unit itself is meant to allow students to experiment with speaking Shakespearean English, and to build their confidence. No one play is studied in depth, but rather a selection of his works are briefly discussed and key scenes are read through. An engaging and detailed pub-quiz style Powerpoint containing 40 questions and answers to introduce students to the weird and wonderful life of William Shakespeare. The questions are split into four rounds, each containing 10 questions: Shakespeare’s life and family, Shakespeare’s character, Shakespeare’s writing and The Globe. This could be used as one whole lesson, or as a detailed starter across multiple lessons. It is suitable for any age group learning about Shakespeare, but would be particularly good for key stages 3 or 4. Leave a review and choose any other resource for free from the <a href="https://www.tes.com/teaching-resources/shop/LikeAnExpert ">LikeAnExpert</a> shop. SCHOOL MAP REQUIRED! Activity and lesson plan included. Lesson that uses the outdoor environment and requires children to read a basic birds eye map of the school. In mixed groups children complete quiz by going to the correct cards. Back in ability groups children produce some writing about William Shakespeare. Introductory Lesson to Shakespeare: Kinaesthetic! Introduce students to Shakespeare in a fun and active way by kinaesthetic activities and interesting fun facts about his life and themes of his work. Shakespeare's World! GCSE English Literature (New Spec) AO3 Context Lesson. Using active approaches to develop an understanding of Shakespeare's Life and Times and the World in which he lived. Fact sheets/timers included for a group memory game as well as video clips showing R & J as performed in the Globe Theatre (Shakespeare in Love clip included) as well as extension and speaking and listening opportunities to further enrich contextual understanding. A fun lesson to start a Shakespeare module, looking at Shakespearian insults, how Shakespeare has influenced our language today and how he is still relevant. A mixture of fun facts about Shakespeare to play a bingo game, a research sheet, a Shakespearian insult activity and opportunities to analyse and explore interesting use and change of word classes. Easily adaptable for all abilities. I used with a year 9 set 4 class and it was really successful. All learning objectives, success criteria, real world link, levels and stretch and challenge opportunities are included. Fun Do Now and Plenary activities also included. This short video is a great starting point for discovering the words and phrases that were supposedly invented by Shakespeare. Take this further in this stimulating lesson by getting your classes to analyse some of his classic insults for both humour and offensiveness, before prompting them to create their own. In terms of more substantial units of work, these popular schemes on Romeo and Juliet and Macbeth offer interesting routes into two very well-known plays for KS3 students. GCSE-level classes will most certainly benefit from the support that this lesson provides on how to write a successful Shakespeare essay. And let’s not forget Shakespeare’s sonnets! This complete lesson allows students to delve deeper into the structure and themes of Sonnet 130, in order to give them the tools to compose their very own. A lesson I put together as part of an Introduction to Shakespeare SOW. This is a stand alone lesson based on insults created by Shakespeare, created for my mid ability Year 7 class. Includes some differentiation. A short unit of work in which students watch Romeo and Juliet before looking closely at the text. 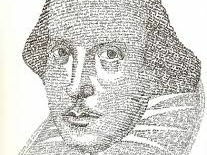 The second part of the scheme of work has students thinking carefully about how they write analytically about Shakespeare and develops their essay writing skills. Used for Year 9 classes, but could be adapted for other years. Scheme for Macbeth - Includes a range of activities approved by the RSC, and resources to help visual, kinaesthetic, and auditory learners to understand the play. Culminates in a reading assessment. This lesson and resources draw on the AQA GCSE mark scheme but could be adapted for any board. The presentation gives you the full lesson; the first word attachment contains the sample intros and concls, whilst the second is the answer sheet with the bands and marks awarded. STARTER: INDIVIDUAL - Pupils note down what they think makes a good introduction and conclusion. Class list of features created from feedback. TASK 1: GROUP - Pupils divide into four groups and each is given a different pair of introductions and conclusions from Band 4 and Band 5 exemplar essays. These are differentiated according to ability, with more complex writing provided to stretch those pupils already working within these bands. Pupils analyse and annotate the examples using the class list of features, as well as the AQA mark scheme from the previous lesson. TASK 2: GROUP - Market-place activity: one pupil remains with their example whilst the rest of the group “visit” another example and listen to the leader’s response to it. TASK 3: WHOLE-CLASS - Q and A so that responses can be added to the class list of what makes a good introduction and conclusion. TASK 4: INDIVIDUAL – Using the class list and prior learning from the market-place activity, pupils start work on their own introduction for any given essay. PLENARY: Peer-marking: pupils swap their introduction with a partner who assesses it using the class list of what makes a strong introduction as well as the AQA mark scheme. Looking at the structure and themes of sonnets - with a focus on sonnet 130 and the idea of 'real love'. Leads to an activity where students write a sonnet about someone they love but who may irritate them! Very popular with students at KS3 and KS4.